Sunburst Lemon Bars are the best lemon bars I’ve ever tasted and I’m so excited to share the recipe with you all. The bright flavor is reminiscent of stepping into a burst of sunlight. What is not to love about a sweetly tart lemon bar with a melt in your mouth shortbread crust and a lemony glaze on top? I love traditional lemon bars with powdered sugar dusted across the top and a crisp crust on the bottom, but sometimes you just want something different. Sunburst Lemon Bars start with a buttery, flaky shortbread that is so good, I’ll happily eat it plain. To make the shortbread even better, we’re going to top it with a gooey lemon filling that is sweet and tangy and spoon-licking delicious. Then, the literal icing on the cake is a lemon glaze to take it right over the top. Sunburst Lemon Bars are like no other lemon bar I’ve ever tasted. With a review like that how can you resist? These bars are a gooey sweet twist on the classic, with just enough tang from the lemon juice and zest to balance the sweetness. We’ve been making these bars for a few years now and every time I make them, I wonder why I waited so long to make them again. 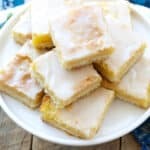 As a long time fan of traditional lemon bars, I will admit now that I haven’t made a single batch of the classic lemon bars since I found this recipe. I make lots of different dessert bars with fruit filling and while I enjoy them all, from Apple Pie Bars to Pineapple Coconut Bars, Sunburst Lemon Bars are near the top of the list of my personal favorites. I could eat one every day and probably not get sick of them (which is saying something since I don’t usually have much of a sweet tooth). This lemon bar recipe can be made gluten free and with regular all-purpose flour. My preferred gluten free flour blend for this recipe is combination of brown rice flour, potato starch and tapioca starch. I’ve made and loved them both the gluten free way and the regular way many times. Gluten free lemon bars are a great dessert to bring to a party or gathering of any kind even if you can eat gluten. 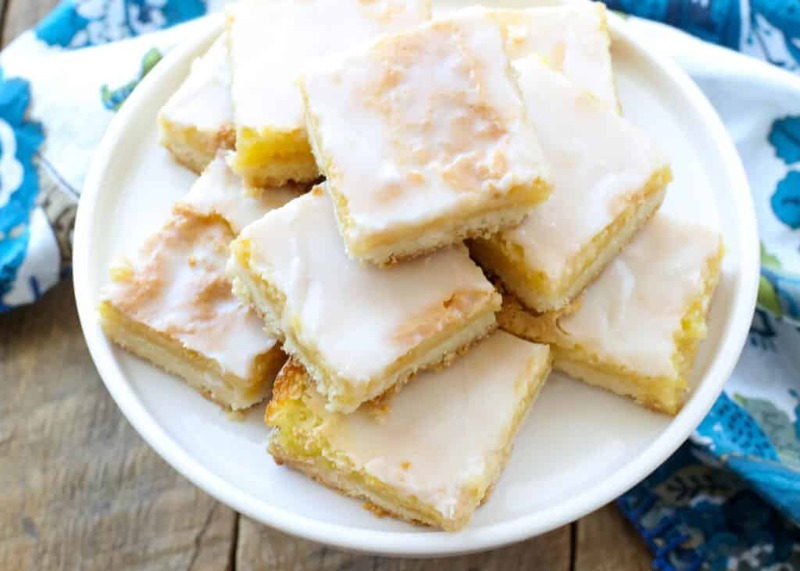 They taste better than any “regular” lemon bar AND the gluten free folks at the party will want you to be their new best friend when you show up with an incredible dessert that they can enjoy too. The lemon filling in this recipe is what really makes these bars burst with flavor. I use a more than generous amount of fresh lemon juice and zest to pack each bar with the tart and tangy taste of lemon. If you don’t like your lemon desserts quite so tart, feel free to reduce the amount of lemon zest and juice in the recipe. I, however, like them just as they are. The glaze in this lemon bars recipe really sets them apart from the crowd. When the glaze sets it creates a beautiful layer of pure sweet extra lemony goodness on top of the lemon filling. 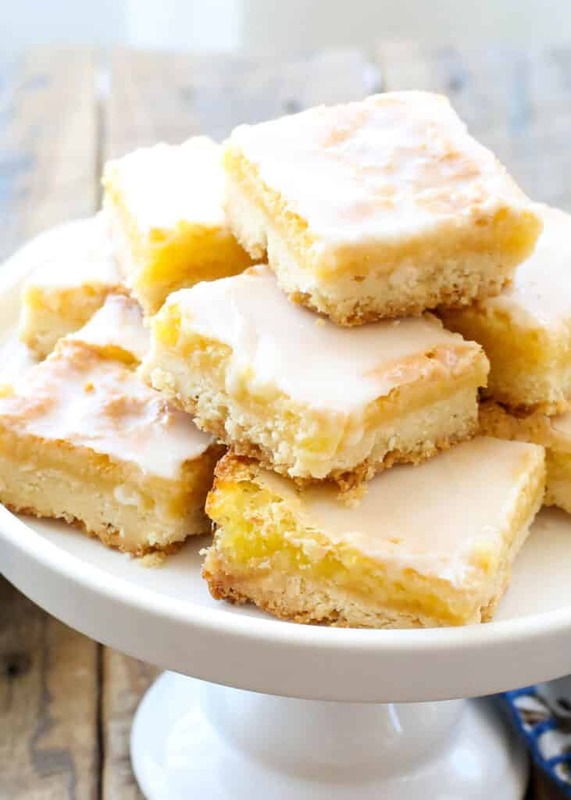 If you have any lemon dessert lovers in your life, you MUST make them these lemon bars. With some lemon desserts I find that the lemon flavor just isn’t strong enough for my liking. If I eat a lemon bar I want to taste the lemon first and foremost. It just doesn’t get any more citrusy and lemony than Sunburst Lemon Bars, I promise you. These are quite simply the very best lemon bars you will ever make. 1.Heat oven to 350 degrees. Combine the butter, sugar and lemon zest in a mixing bowl and beat for a minute or so until combined. Add the flours and the beat until the mixture is crumbly. Press the crust into the bottom of a parchment lined or an ungreased 9×13 pan. Parchment paper is not required, but it will make slicing the bars and removing them from the pan much easier. Bake for 25 minutes, until light golden brown. 2. While the crust is baking, in a large bowl lightly beat the eggs with a whisk. Add the remaining ingredients and beat with a whisk until combined. Remove the partially baked crust from the oven and pour the filling over it. Return to the oven and bake for an additional 25-30 minutes, until the top is light golden brown and starting to crack around the edges. Let cool completely, at least 1 hour. 3. In a small bowl, stir or whisk together the powdered sugar and lemon juice. Add more lemon juice, by just a few drops at a time, until the glaze is a pourable consistency. Spread the glaze over the cooled bars and then let it set for at least half an hour before slicing. Cut into bars and store in the refrigerator. Bars can be served cold or returned to room temperature first. Enjoy! If you love lemon desserts, you’ll want to check out this Lemon Angel Pie, Lemon Crinkle Cookies and this 5-Minute Lemon Curd. (I’m serious, FIVE minutes to perfect lemon curd. Make it now and you can thank me later!) These Coconut Lemon Pudding Parfaits and this Blueberry Lemon Shortcake need to be on your list of desserts to try as well. I used two lemons worth of juice and zest for this recipe. Feel free to adjust the amounts to your tastes. I like a tangy lemon dessert. If you prefer your desserts less so, reduce the amounts slightly. I'm a little confused with the directions. The base crust is meant to bake for 25 minutes, in the filling instructions it says to fill the partially baked crust with the filling. Do we bake the crust for the full 25 minutes then add the filling or bake the crust for half the time noted and then add the filling? Yes, bake for 25 minutes, then remove the partially baked crust from the oven and pour the filling over it. Return to the oven and bake for an additional 25-30 minutes, until the top is light golden brown and starting to crack around the edges. Here it is only gluten free recipe for lemon bars. Where is the traditional one?? Per the recipe above, * If you are not in need of a gluten free recipe, simply substitute 2 cups all purpose flour for the items marked with an * in the crust ingredients and 1/4 cup AP flour for the item marked with an * in the filling. I love everything with lemon. Can't wait to try this. What is tapioca starch....what is potato starch..
Greetings from Buenos Aires, Argentina. I love, love, looooove this recipe. Made them this morning that they are just perfect!!!! This one is going straight to my recipe book. Thank you!!! this is wonderful, i remember a few years ago i had almond bars that look just like your lemon bars, so could i trade out the lemon for almond extract? I made these yesterday but the filling turned out kinda runny even though the top was a few notches over golden brown. Do you have an idea what went wrong? They freeze great! Even partially thawed they are delicious! I made your Sunburst Lemon Bars for our Spring Fling luncheon at work and my coworkers went crazy over them. Thanks! for the non gluten recipe, will i substitute 2 cup AP flour for each (brown rice flour, tapioca starch, and potato starch) or 2 cups AP flour for all 3? 2 cups total. Happy baking! Can this be made in a 9x9 pan.? How long would I bake these?